Bay to Breakers, scheduled for May 17 is one of the largest road races in the world. According to the website, in 1986 78,796 registered and more than 110,000 total participated, officially becoming the world's largest footrace. Feb 26- Travel to San Jose. Got up early thinking I could get an early run in but not with about 8" of snow on the roads. My legs could use the rest but felt pretty stiff after a full day of travel. Feb 27- easy 4 miles in San Jose. 2 days before the Napa Valley Marathon. Bad news is the weather forecast calls for rain and wind. The course runs point to point in a southwest direction. Wind is forecast out of the south or southwest at 6 mph. napa weather . Driving to Napa after a short run tomorrow. pm- 6 miles at marathon pace- snowing and cold out! Felt pretty good once I got warmed up. Went through my 800 meters between miles 5-6 in about 3:24 into the wind. 4 days until marathon. Mon Feb 23- easy 4 mile recovery jog with Sumo. Tues Feb 24- 2 mile jog with Sumo,then 4 mile time trial in 20:38 Ironically, that is the exact same time that I recorded on this course Nov 10, 20 days prior to the Seattle Marathon. Marathon Entry Fees- Can You Still Afford This Sport? Members of the New York Road Runners will pay $13 more than they did last year, with the fee increasing to $138. Nonmembers will pay $171, an extra $16, and those from other countries entering the international lottery will pay $21 more, $231. In fairness to New York, Mary Wittenberg president and chief executive of New York Road Runners, estimates their cost at "easily more than $250 per runner." “We’re a not-for-profit, we can’t afford to lose money and we’re trying to break even,"
MY COMMENT: Olympic 5,000 meter runner Matt Tegenkamp is undergoing this new procedure. Pittsburgh Steelers Troy Polomalu and Hines Ward both received this treatment for injuries suffered prior to the Super Bowl. Pleasant surprise, considering the interval workout I did the evening before. Can't make it? 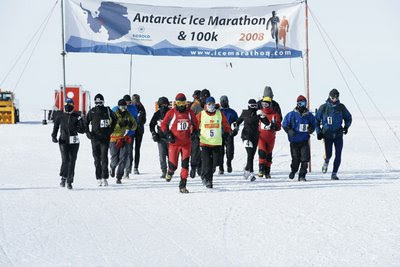 Not to worry- the North Pole Marathon is April 7th! Some days you just don't have it, mentally or physically. I jogged 3 miles with Sumo intending to tackle some intervals but never even started. My normal routine is to drive the 1 mile distance to the trail and start from there when I have Sumo. Feeling the way I did, I happened to have my mountain bike in back and did 6 x 800 repeats with it instead. My quads were burning, my cardio was taxed, and I felt good doing it, something that would not have experienced had I been running. Triathletes have shown us that cycling can improve running. If I lived in a warmer climate, I'd be doing this more often. 3 miles total- so what? Napa Valley Marathon - What Are They Thinking? MY COMMENT: This is so obviously stupid I am not going to even comment. Thank goodness Gatorade is at the aid stations every 1.5 miles. am: 1 mile jog with Sumo, then 17 miles in 1 hr 55. I felt pretty strong today. Wore my racing shoes and it was warm enough for me to get by with a light weight long sleeve shirt. I would have loved it if I could have run another 5 minutes faster but this is where I am at. With 1.5 miles to go I ran over the section of trail where I do 800s and hit 3:13 so I was moving pretty good. This was my last run over this distance. In the next 10 days I will be doing everything I can to improve my speed- tempo work, intervals and hip range of motion exercises- I figure if I can just gain a 1/2 inch each stride it will help. I am feeling strong but believe that I can run faster. I might even give a half hearted attempt at losing a pound. I have been weighing in at 130-131 lately- not sure but I swear that is a bit heavy for me. I don't have any recollection of weighing in before I ran the Seattle Marathon in Nov.
Jenny Barringer Runs 15:01 for 5K- 2nd Fastest American All Time! American distance runners are tearing it up this indoor track season, as U of Colorado runner and Olympian Jenny Barringer turned in a sparkling 15:01 yesterday on the U of Washington's oversized indoor track. It would have been interesting to see her go head to head with Shalane Flanagan who set the American record last weekend (14:47). cubuffs.com Also running well in the same meet was German Fernandez, who turned in a 7:47 for 3,000 meters, the fastest ever run by an American Junior (under 20 yrs old). Cal's Michael Coe gave Fernandez all he could handle finishing 2nd in 7:48. Watch the last 3 laps! MY COMMENT: Doug Padilla still had an American record? I saw him recently taking photos at a U of Washingtion track meet- he's an assistant at BYU. I always enjoyed watching him run- very smooth and very tough. Rupp will have his hands full with indoor and outdoor obligations running for the U of Oregon, but I would love to see him race this summer. I still think Chris Solinsky will be tough to beat based on what I've been reading, although he may be in the steeplechase instead of the 5K. 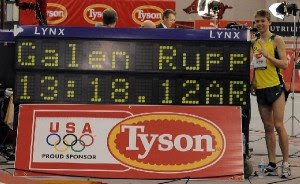 Can't take anything away from Rupp- first ever sub 13:20 indoors by an American. am: easy 4 miles with Sumo- takes me to 65 miles for the week. Resting for a long one tomorrow. am: 1 mile with Sumo, then 12 mile run. Average pace, but legs pretty beat the last 2. total miles= 13, total for the week 61 miles in 6 days. 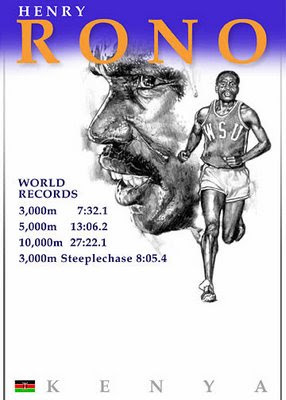 Where is Henry Rono Today? At last reports Henry is teaching middle school in Albuquerque, New Mexico and coaching his team-rono athletes. At age 56, Henry is back training with his sights set on age group world records. Henry Rono Flashback- How Good Was He? What happened in 1978 was that Rono started drinking. 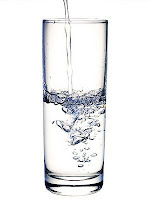 Nothing excessive at first, but rather a simple indulgence into the post-race or off-season practice that was then fairly common in distance running culture. 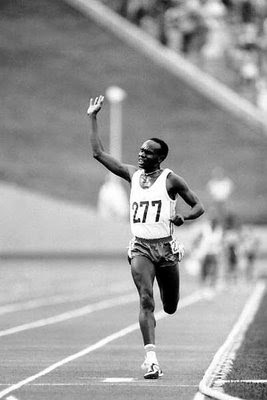 In 1980, when Kenya boycotted the Olympics, Rono began cursing his fate and his luck, and the drinking become a real problem. The following year his weight was fluctuating severely, and Rono was fast succumbing to alcoholism. He somehow managed to put a track season together, despite drinking daily, and late in the summer was invited to small meeting in Knarvik, near Oslo, for a crack at his 5,000 metres world record of 13:08.04. As soon as Rono arrived in Norway he promptly started drinking, and by all accounts got hammered drunk in the meeting hotel the night before the race. He woke the next morning with a massive hangover, naturally enough. Filled with remorse, Rono went running, practically flat out, for over an hour in an effort to sweat the alcohol out of his system. Mon- easy 5 miles on trail with Sumo. Recovery following long Sunday run. Tues- 1 mile jog with Sumo, then 14 x 800, 3 mile jog with Sumo. 14x800 with <60 sec recovery is a workout I have never attempted. I started out at 3:15 and got the last one down to 3:01. Ave was probably a 3:08 or so. It sounds worse than it was- think of a 7 mile tempo run with a 45 sec walk every 3 minutes. For the last 4 weekends I've run 18 miles- a 1 mile jog followed by a 17 mile out and back. My times have been dropping progressively each week- until today. I could tell immediately that this was not going to be a good run, and my thoughts turned to all of the contributing factors. Why was my breathing more labored than usual? In my case, 1,2, and 8 are the most likely candidates. Even though yesterday was an easy jog, the day before that was a pretty hard effort, and I may have needed 2 recovery days. 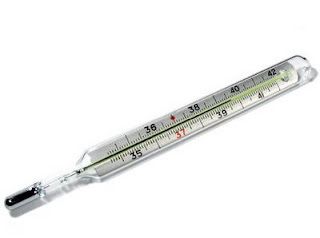 I am still feeling flat from a cold, and unlike last week I wore an extra layer of outerwear. I also used a heavier pair of training shoes (following my intervals I noticed some slight foot pain so thought a little extra protection would be a good idea). Last week, I hit the turnaround in just under 58 minutes. Today it was 61 minutes. Rather than force the pace, I decided to finish with a moderate effort, running the second half in 65 minutes. Compounding the problem was some friction (hot spot) developing on my left arch. I rarely wear these shoes, and by the turnaround I knew I would have to do something to fix the problem. For this reason, on long runs it's always a good idea to carry a band aid or 2. When I don't have one I usually start to look for something alongside the trail to put inside my shoe and protect the hotspot. Eventually I came across an old wax cup that did the trick. The only consolation on this run is I believe recovery will be quick. The other is the realization that you just can't expect to see a weekly progessive drop in times week after week. Fitness does not work that way. Just like racing, sometimes it just isn't your day in workouts either. MY COMMENT: Should your kids be running? Absoulutely! Should they be running marathons? Absolutely not! Go to kidsrunning.com for some great information on how to keep your kids in the sport- sanely. am: Finished up the week with an easy 5 mile jog with Sumo. Again I was tempted to go long but decided the wisest course was to lay low and rest for a hard, long one tomorrow. 3 weeks until Napa Valley, so after this one I expect to start dropping the long run distance. total for the week = 60 miles. Are you tired of running good times for your age and finishing back in the pack? Check out how you compare to the winner using the age-grading calculator at runnersworld.com. 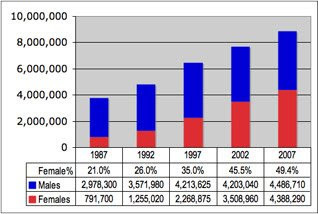 The largest races in 2007? When the horn starting the women’s race sounded in the lobby, the group fought for position in their efforts to run freely into the stairwell. As the tightly bunched pack reached the door after a 20-yard sprint, Walsham was pushed hard to the side; she hit the marble doorway and fell full-length in the stairwell, badly bruising her face and left knee. Several runners inadvertently stepped on her. With the help of three of her competitors, she finally reached her feet. At that point, she was in about 20th position and in considerable pain, and the leaders were several floors above her. “I didn’t come all this way to pull out,” Walsham thought, and started to run. This great video clip from runnersworld.com may save your next race! I think I've been doing it wrong all these years. Rehearsing: Everything’s down to a science as far as when you drink and how many calories you take in. We practice all that. We rehearse, even down to wearing the race-day uniform to ensure no chafing. Note: Dathan is currently preparing and looking for a fast time at the London Marathon April 26. Feb 4 pm- 2 mile jog with Sumo, then 8 miles in 60 minutes, jogging the last mile. Good run despite the cold. I was surprised. am: 4 miles with Sumo, then 8 miles easy. Fighting off a cold but fortunately not feeling so bad that I can't run. Nothing yesterday though, however I was beat up from that hard 17 on Sunday. MY COMMENT: Mary Slaney was a talented runner (she set 6 world records in 1982 from 1 mile - 10 K) but her imaged was tarnished by the 1984 Olympic debacle (the Zola Budd incident), and finally when she tested positive for high testosterone levels in 1996. She was cleared by USA Track and Field the following year but not by an IAAF arbitration panel, who stripped away her silver medal won at the 1997 indoor world championships. Oh yea, and she had her share of injuries and lower leg problems. Japanese Marathoner Runs 2 hr 36:30 at Age 60! Yoshihisa Hosaka of Japan broke the existing world record for men 60 and over at the 58th Beppu-Oita Mainichi Marathon on Feb. 1. According to the post at Japan Running News, Hosaka averaged 30 kilometers per day training for his record attempt. MY COMMENT: Truly amazing. I would love to study his training- he must do huge volumes at a slow pace in order to recover. It's hard runners in their 20s to average 18 miles a day!